Singapore (March 5, 2015) – More than 80,000 trial decks were sold within the first week of release of the Cardfight!! Vanguard G Trial Deck Vol. 1 ‘Awakening of the Interdimensional Dragon’, G Trial Deck Vol. 2 ‘Divine Swordsman of the Shiny Star’ and G Trial Deck Vol. 3 ‘Flower Maiden of Purity’. These trial decks were released on February 27, 2015. These Cardfight!! Vanguard G Trial Decks join the ranks of other Cardfight!! Vanguard expansions that sold out within weeks of release; including Booster Pack Vol. 16 ‘Legion of Dragons & Blades’ ver.E, Extra Booster Pack Vol. 11 ‘Requiem at Dusk’ and Extra Booster Pack Vol. 12 ‘Waltz of the Goddess’. More than 950,000 packs of Booster Pack Vol. 16 ‘Legion of Dragons & Blades’ ver.E were sold within a month of release. Extra Booster Pack Vol. 11 ‘Requiem at Dusk’ and Extra Booster Pack Vol. 12 ‘Waltz of the Goddess’ sold a combined 600,000 packs over the release weekend. The next expansion for Cardfight!! Vanguard G, G Booster Pack Vol.1 Generation Stride, will be released on March 13, 2015. Cardfight!! Vanguard G marks a new beginning for Cardfight!! 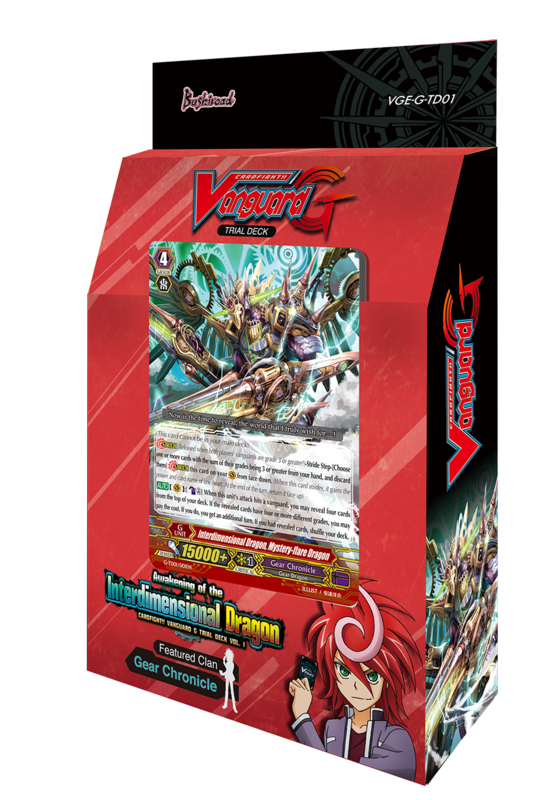 Vanguard and is the latest expansion of Bushiroad’s most popular trading card game. It features new cards, abilities and a new clan, Gear Chronicle. The new expansion introduces new abilities such as Stride, Generation Break and G-Assist into the game. Cardfight!! Vanguard G Trial Deck Vol. 1, Vol. 2 and Vol. 3 feature cards that are used by the new protagonists of the Cardfight!! Vanguard G anime. Each display contains a card signed by the artist of the unit, randomly inserted into one of the trial decks. Additionally, exclusive promotional cards were given out with every purchase of one of the three trial decks.